Ousmane Dembele’s Barcelona exit seemed almost inevitable two months ago. The Catalan club seemingly gave up on their second-record buy. Fast forward to January, the Frenchman was suddenly Ernesto Valverde’s second-most-important attacker. Forgive me, but the other guy's name slips my mind. Then an unusual silence filled the Camp Nou during their match against Leganes. It wasn't the other guy, the little one from Argentina. He started on the bench. Nor did Gerard Pique conjure another of his infamous own goals. Sixty-five minutes in, there was the danger the Cucumber Growers would pluck a memorable double after equalising through Martin Braithwaite but that wasn't it, either. It was Dembele. The 21-year-old hobbled around the perimeter after falling badly on his left ankle courtesy a reckless Youssef En-Nesyri tackle. It was an abrupt, painful end to a sparkling evening for the Frenchman. Even the little Argentine darling's introduction failed to lighten the mood. Mooted for a January exit, his terrible form was understandable as it happens to many young players signed too early to big clubs. It was his off-field demeanour that confounded. The Frenchman turned up two hours late for training one day. He skipped two training sessions the following week, supposedly due to a stomach bug. Heading into La Liga midpoint, he'd started just seven matches. Issues over immaturity, video game addiction and gambling surfaced. Teammates were frustrated. Pique and Suarez didn't hold back. The Catalan advised Dembele to “understand that football is a 24-hour job and he has to live accordingly”. The Uruguayan chimed in with, “I think he needs to focus more and be more serious on some points.” Peer pressure sometimes works. Dembele turned over a new leaf, returning from holiday more focussed than ever. Desperate to make amends, he chased every ball with intensity, never giving up. He thrived on the responsibility from which he previously shrank. Woe betide any full-back who let him put on the afterburners in a one-v-one. Barca reaped the bounty. Last Sunday's strike was his 13th of the Liga season, a personal best, beating the dozen he scored for Rennes in 2015/16. He created four others. The Frenchman shouldered a sizeable share of the attacking and creative burden in Ernesto Valverde's front three. Dembele is no longer the weak link. He brings an extra dimension thanks to his pace, direct running and eye for a pass. The ability to score with either foot makes him even more difficult to mark. The 21-year-old can thrive on either flank. His versatility increases the Cules' attacking fluidity. Valverde deserves some credit. He kept the faith despite pressure from all and sundry. Dembele's teammates were helpful, too, even that Albiceleste lad. He must have felt like a proud dad to watch little Oussy dazzle against Leganes. 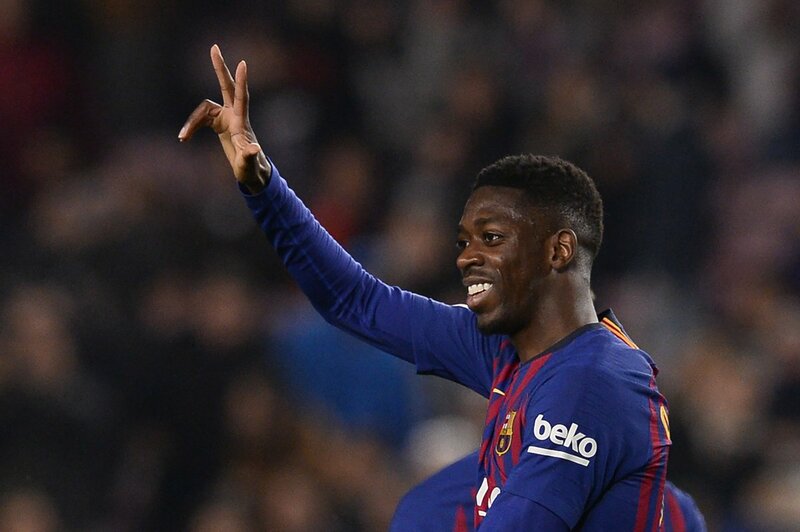 Yet, just as he had to accept full responsibility for his career, Dembele deserves the lion's share of the accolades.